Xherdan Shaqiri's superb strike sealed a first Premier League win in six games for Stoke City as Mark Hughes' men proved too strong for relegation-threatened Hull. Shaqiri, whose last goals came in the reverse fixture against the Tigers in October, took aim from 30 yards to deliver an unstoppable shot beyond the reach of Eldin Jakupovic. Marko Arnautovic had earlier put the hosts into an early lead with a thumping strike before spurning two glorious chances to add to his tally. Harry Maguire hauled Hull level with an untidy finish, but a double substitution by the hosts provided key as Jon Walters crossed for fellow replacement Peter Crouch to restore the lead. Hull are now winless in 16 away league games dating back to August, but remain two points outside the relegation zone thanks to Swansea's loss at Watford. Stoke, meanwhile, climb to 11th after convincingly avoiding the ignominy of losing five top-flight league games for the first time since 1985. A few boos greeted Hughes' decision to make a double substitution just before the hour mark, the withdrawal of Saido Berahino in particular appearing to irk some of the Stoke fans. The change came just seven minutes after Hull had equalised, and with the visitors looking the most likely to add to their tally Hughes was forced to act. Throwing on Crouch and Walters - with a combined age of 69 - was a calculated move by the Stoke manager designed to unsettle Hull's towering backline, who while uncertain on the ground had been winning most balls in the air. Within two minutes of their introduction, former Hull striker Walters forced Jakupovic into a fine save from a diving header, but that was just the prelude to what was to come. With 66 minutes gone, Walters picked the ball up on the left and delivered a perfect cross for Crouch, who needed the whole of his 6ft 7in frame to rise above Andrea Ranocchia and score for the first time since he registered his 100th Premier League goal against Everton in February. Hull came close to levelling a second time when Kamil Grosicki cut inside and forced Lee Grant into a smart low save, but any hopes the visitors had of snatching a point were emphatically ended by Shaqiri, whose long-range effort was just his fourth goal of the season - three of which have come against Hull. Although this is a painful defeat for the Tigers, they at least end the weekend with their fate in their own hands as their two-point gap to the bottom three remains intact with five games to go. Crucially, three of those are at home, where they have picked up 16 of the 17 points they have earned since Marco Silva was appointed in January. Should that form continue in games with Watford, Sunderland and Tottenham, they might just survive. But the feeling is Hull need to pick up something on their travels if they are to beat the drop. They showed enough against Stoke to suggest they are quite capable of ending their seven-game winless run away from home in the Silva era, but to do that they will need to be more clinical in front of goal in their remaining road trips to Southampton and Crystal Palace. Stoke boss Mark Hughes: "It was a big three points, an important three points. We've come through a period that was arguably our most testing of the season in terms of fixtures. "For the most part this season we've picked up points against the teams below us and that's what we've done today. "We eventually needed to make a change to get a bit more threat and they helped. Jon Walters plonked it on Crouch's head and the game's done from my point of view. Shaqiri's goal was the icing on the cake. "As a consequence of winning today I think we can probably express ourselves a bit more in the remaining games." Hull boss Marco Silva: "I'm not happy with our performance in general. We need to do more. We need to improve. At this level we need to start strong and play 90 minutes, not 80 minutes. "Our team only played 80 minutes because the first 10 we didn't play. We can't start the game like we started. "Only our team can change the situation. Five more games, the next game is a chance for more points." Stoke now have a 60% win rate against Hull in the Premier League; their highest percentage against a team they've played at least 10 times. Hull remain winless away from home under Marco Silva in the league (L6 D1), despite being unbeaten at home (W5 D1) - the only other two managers to do the same having managed at least five games home and away, was Rafa Benitez at Newcastle in 2015-16 and David Webb at Chelsea in 1992-93. Marko Arnautovic has been directly involved in 10 Premier League goals this term (six goals, four assists); the most of any Stoke City player. Each of Xherdan Shaqiri's past five goals in the Premier League have been scored from outside of the box. Half of Shaqiri's assists in the Premier League have been for Marko Arnautovic (four of eight), with all four coming at home. After keeping two clean sheets in their first four league games under Marco Silva, Hull have since conceded in nine consecutive outings. Harry Maguire netted in back-to-back league games for the first time in his career (two goals) - he had scored twice in his previous 93 league outings prior to this run. The Potters have scored 59% of their league goals in the first half this season, the highest proportion of any Premier League side. Swansea, Hull's rivals in the relegation battle, are next up for Stoke, who travel to the Liberty Stadium next Saturday (15:00 BST). The Tigers welcome Watford to the KCOM at the same time. Match ends, Stoke City 3, Hull City 1. Second Half ends, Stoke City 3, Hull City 1. Corner, Stoke City. Conceded by Michael Dawson. Attempt blocked. Erik Pieters (Stoke City) left footed shot from outside the box is blocked. Assisted by Jonathan Walters. Attempt missed. Alfred N'Diaye (Hull City) right footed shot from the right side of the box misses to the right. Attempt blocked. Sam Clucas (Hull City) left footed shot from outside the box is blocked. Assisted by Harry Maguire. Dieumerci Mbokani (Hull City) wins a free kick in the attacking half. Substitution, Stoke City. Mame Biram Diouf replaces Xherdan Shaqiri. Offside, Stoke City. Marc Muniesa tries a through ball, but Marko Arnautovic is caught offside. Substitution, Hull City. Ahmed Elmohamady replaces Lazar Markovic. Substitution, Hull City. Dieumerci Mbokani replaces Oumar Niasse. Goal! Stoke City 3, Hull City 1. Xherdan Shaqiri (Stoke City) left footed shot from outside the box to the top left corner. Assisted by Marko Arnautovic. Attempt blocked. Jonathan Walters (Stoke City) right footed shot from the centre of the box is blocked. Assisted by Marko Arnautovic. Attempt blocked. Harry Maguire (Hull City) right footed shot from outside the box is blocked. Assisted by Lazar Markovic with a cross. Corner, Hull City. Conceded by Geoff Cameron. Corner, Hull City. Conceded by Bruno Martins Indi. Attempt saved. Kamil Grosicki (Hull City) right footed shot from the left side of the box is saved in the bottom right corner. Assisted by Sam Clucas. Foul by Xherdan Shaqiri (Stoke City). Substitution, Hull City. Abel Hernández replaces Tom Huddlestone. Lazar Markovic (Hull City) is shown the yellow card. Foul by Lazar Markovic (Hull City). Oumar Niasse (Hull City) wins a free kick on the right wing. Harry Maguire (Hull City) wins a free kick in the defensive half. Goal! Stoke City 2, Hull City 1. 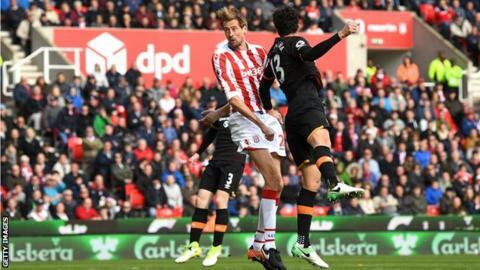 Peter Crouch (Stoke City) header from the centre of the box to the bottom left corner. Assisted by Jonathan Walters with a cross. Attempt missed. Oumar Niasse (Hull City) right footed shot from outside the box is high and wide to the right.